Considering the cost of vet visits, cost of medicine and other health related expenses, proper feeding could easily help us avoid the unnecessary expenses and emotional trauma of watching our furry friends go through a health phase. We might be tempted to buy a cheap pet food for our canine and feline friends, but this is usually not a good choice as there are always risks to consider. The choice of your pet’s food is an important decision you do not want to take for granted, in fact, if you decide to cut back the cost of your pet care, the pet food should be the last item on the list to consider. 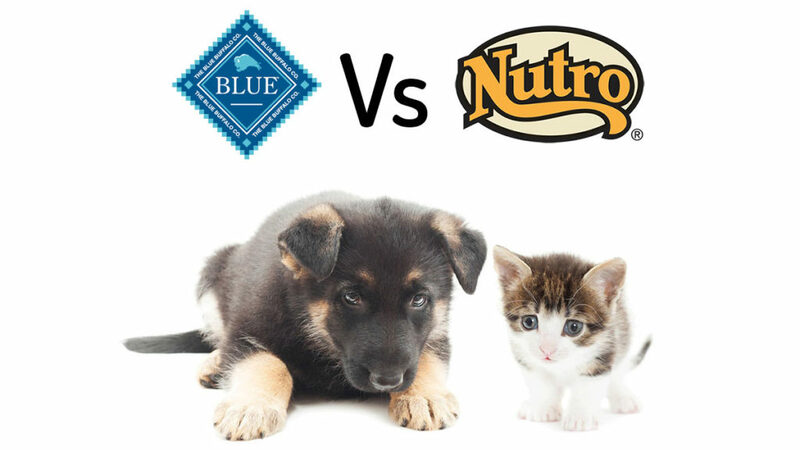 To ascertain the best quality pet food for your dogs and cats, we are comparing two of our favorite brands that have been tested and proven to have great quality, Nutro and Blue Bulffalo. Nutro and Blue Buffalo are two popular, nutritious, and highly sort after brands but how can we ever decide, since they are both great brands? It’s pertinent to base your pet’s feeding choice on good information. Let’s see what these pet food brands have to offer in terms of their nutritional values, product safety, cost and other important factors. Blue Buffalo have 1.5% more protein than what Nutro offers for dry canine foods and 2.1% less protein than Nutro for wet canine foods. Nutro dry feline food has 1.8% more protein than Blue Buffalo, also, Nutro wet feline foods has 6.3% more protein than Blue Buffalo wet feline foods. There is relatively no significant difference between the protein content of both brands except for the wet cat foods where Nutro dominates with 6.3% difference. The Nutro brand is more affordable than the Blue Buffalo but its wet pet foods are relatively more expensive that the wet pet foods of Blue Buffalo. Which one has more flavor? Blue Buffalo has a total of 339 flavors while Nutro has 223 flavors for both cats and dogs. In comparison, both brands have an extensive amount of food types for dogs and cats as well as treats. Nutro has a total of 223 recipes for both dogs and cats while Blue Buffalo has 339recipes for both pet types. The Nutro brand offers no recipe for cat treats. How much calories should you feed your dogs and cats per day? Does the food content being provided daily meet the standard nutritional needs of your pet? How much is too small or too much? A proper examination of the dog or cat food label of choice is an excellent way to ensure you are selecting a pet food that meets the best nutritional requirements that would support a long and healthy life for your dogs or cats. The benefit of choosing popular brands in relation to nutritional value is to provide your pets with delicious, irresistible meals that they cannot wait to dig into as well as meals that nourish and boost the immune system and mitigate possibilities of diseases or infections. The three main nutrients that play vital roles are protein, fat, fiber and moisture. Let compare both brands based on their nutritional value. Dogs and cats cannot survive without the essential amino acids supplied by the protein they consume every other day. House pets, especially dogs and cats, can tell when their diet lacks a hint of flavor which is mostly delivered by essential amino acid and fat. They tend to avoid such a meal when it is unpleasant to their taste buds as well as difficult to digest. They can also survive on a vegan diet if it contains enough protein and vitamin D as supplement. Different pet food brands have varying protein percentages, however, it’s important to check out their different recommended feeding range so as not to under feed or over feed your pet with protein as this could result to digestive issues. Like their ancestors, dogs and cats mostly thrive on meat and have a digestive system well suited for the consumption of animal protein. As far as protein content goes, Nutro is seen to have an upper hand on both cat and dog food with an exception to the dry dog food. Dietary fats are fat content obtained from animal or plants which supplies essential fatty acids that cannot be synthesized by dogs and cats. These fatty acids play important roles in our pet’s cell function and structure. Not only do these fatty acids enhance the taste and texture of the pet’s food, they also keep the skin and coat of dogs and cats healthy and shiny. Fats help our pets retain water in their body system and reduce inflammation in dogs and cats. Fat provides energy needed by cats and dogs required for their daily lives. Nutro and Blue Buffalo both provides almost the same amount of fat in all their products. For proper function of the gastrointestinal systems of dogs and cats, fiber must be present in their diet. Excessive consumption of fiber by our pets could help in controlling our pets’ weight, help in managing hyperglycemia and increase the functioning of the large intestine. For some dogs and cats, excessive fiber diet could result in frequent defecation, reduced palatability of foods and treats, and decrease digestion of other important nutrients. Dog foods with high amount of starch, such as rice, have less fiber content while wheat bran products are relatively high in fiber. The fiber content of our pets’ foods could be lower or higher as required by our pet according to the Vet’s prescription. There is little to no difference between the fiber content of Blue Buffalo and Nutro. However, Blue Buffalo guarantees about 2.48% more fiber than Nutro. Pet care cost can be overwhelming especially when we are on a fixed budget as pet owners. However, a little increase in our budget resulting from our pet food is something we can live with because we can’t really put a price on the companionship and love these furry friends bring to our lives and family. Comparing different cat and dog food prices can be done by just looking at their individual price tags but trying to ascertain which of them actually offers the true value for the money you’re spending is a whole different story. Let uscompare the prices of Nutro and Blue Buffalo pet foods using the average cost per calories and the average cost per pound. It is more accurate to use the average cost-per-kcal metrics when comparing the prices of pet foods because it tells you the average cost of pet food (dry matter basis). Some pet owners still use the average cost-per-lb. This metrics calculates the cost of the food with its water content inclusive. From the table above, it is observed that Blue Buffalo dry dog and cat foods are more expensive than the ones produced by Nutro while Nutro wet dog and cat food seem more expensive than those from Blue Buffalo. However, Nutro offers 100% money back guarantee for all their products if you do not see immediate positive results. Both Nutro and Blue Buffalo provide wet and dry dog and cat foods as well as treats for all pet sizes, breed, and activity levels. Nutro offers a range of great dog and cat food products and the primary ingredient is a real meat source without any unnecessary fillers, animal by-product meal or artificial flavors or preservative. The Nutro brand uses simple yet high quality salmon, sorghum, deboned lamb, chicken meal, brewers rice, rice bran, whole brown rice, whole grain oatmeal, split peas, lamb meal, chickpeas, natural flavor, beet pulp, sweet potato, pork meal, probiotics, flaxseed, chicken fat (preserved with mixed tocopherols), sunflower oil (preserved with mixed tocopherols), soybean oil (preserved with mixed tocopherols), salt, selenium yeast, folic acid, rosemary extract, vitamins and minerals. Every ingredient Nutro uses is purposefully added to deliver superior nutrition and flavor that makes them outstanding. Blue Buffalo provides a variety of healthy, comprehensive foods for dogs and cats of all ages, dietary needs and breeds. This brand uniquely combines real meat, the best natural ingredients and oxidative LifeSource Bits® ranging from fruits to vegetables that supports a healthy balance in dogs and cats. This brand does not use any form ofChicken, eggs, beef, corn, soy, wheat, dairy, by-product meals, artificial flavors, color or preservatives, instead it uses single animal protein source such as turkey and pea protein concentrate, easily digestible carbohydrates, omega 3 and 6 fatty acids, powdered cellulose, caramel color, canola oil, dried tomato pomace, garlic, pumpkin, minerals and vitamins. The Nutro brand since its inception in 1926 has been committed to producing natural, delicious, nutritious and exceptional dog and cat foods as well as treats. The Nutro company is a family owned and operated company, first named as “Nutro Products” in 1926 by John Saleen. The Nutro company has its headquarters in Franklin, Tennessee, USA and it is a subsidiary of Mars Inc.
Nutro pet food has several manufacturing plants are in California, Missouri and Tennessee with a worldwide distribution network cutting across Asia, Australia, Canada, Europe, New Zealand, Oceania and USA. The company relies on the produce of some trusted local farmers for every ingredient used for the formulation of their sumptuous recipes. Pet food products by this brand include Ultra Small Breed Adult, Wholesome Essentials Chicken, Brown Rice & Sweet Potato Recipe, Max Cat Weight Control, Wholesome Essentials Lamb and Rice Recipe, Wholesome Essentials Farm-Raised Chicken and Brown rice Recipe, Wholesome Essentials small bites Lamb and rice recipe, and others. The Blue Buffalo brand was built upon the love and affection Bill and Jackie Bishop (Founders) had for their Airedale, Blue, when the furry family member started suffering from some health-related problems. Blue Buffalo Pet Products Inc. is the parent company of the Blue Buffalo Companywho owns and produces Blue Buffalo pet foods. The company is situated in Wilton. Connecticut, United states and Billy Bishop has been the company’s CEO since January 2017. The Company produces and distributes its dog and cat food products in Canada, Japan, and Mexico. The manufacturing division of the company is operated by several food production companies such as Heartland Pet Food Manufacturing Holding, LLC, Triple T Foods, ProPet, ANI/Vita-Line,Ainsworth, CJ Foods, and Tuffy’s. It formulates, manufactures, markets, and sells dog and cat food under the BLUE Life Protection Formula, BLUE Wilderness, BLUE Basics, BLUE Freedom, and BLUE Natural Veterinary Diet lines names. Some food products by this brand include Wilderness Rocky Mountain Red Meat Recipe, Wilderness Chicken Recipe, Wilderness Duck Recipe, Life Protection Formula Lamb and Brown Rice Recipe, Indoor Health Chickenand Brown Rice Recipe, Healthy Living Chicken and Brown Rice Recipe and others. Companies make scheduled recalls on products that may have a foreseen defect or safety issues. The importance of a recall is to conduct further safety tests in order to effect changes to product to ensure that it is safe for use. Comparing both brands has been quite interesting. I believe it is safe to say that we have a tie because each brand has its own unique properties and qualities. For example, they both have great price range across all meals, their nutritional contents are outstanding and they both have quite a number of flavors to satisfy just about any cat or dog. However, if you prefer a pet food brand with more protein and less recalls then you should opt for Nutro but if your preference is on flavors, the Blue Buffalo brand is a good option.